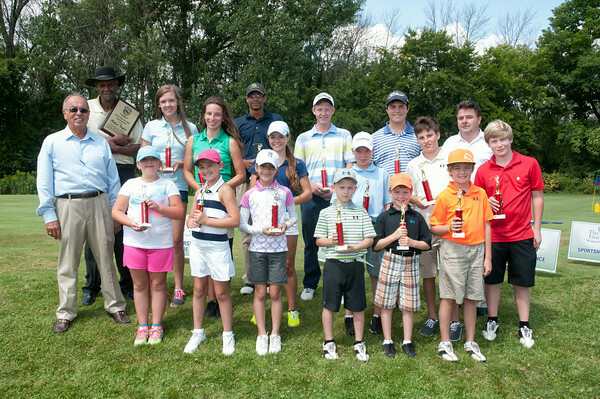 Niagara Falls, NY - The City of Niagara Falls held the 37th Annual Hyde Park Junior Golf Tournament on Tuesday. In the back row from left, is honors recipient Robert Taylor, Madison Townsend 3rd place 11-14, Madeline Catalano, 2nd 11-14, Ryan Langhorne 1st 15-17, Hannah Carey, 1st 11-14, Anthony Delisanti, 2nd 11-14, Stephen Dillon, 2nd 15-17, Will Ritchie, 3rd 11-14, and golf course manager David James. In front from left are sponsor Chuck Colavecchia of CRC Enterprise, isabella Sacco, rd 7-10, Brianna Scozzafava, 2nd 7-10, Mya Genovese 1st 7-10, Adam Firkins, #1 7-10, RJ DeLisanti, 3rd 7-10, Robbie Cehulik, 2nd 7-10 and Jason Cupp, 1st 11-14.